The 2006 trip to Switzerland was a great success - so much in fact that another trip followed a year after, and voilá - here it is. Old sights, Grindelwald in particular, was a definite top priority again, and this time with some new places in addition to this, such as the capital, Bern, and the mountain region between Bern and Lake Geneva, as well as part of the lake area itself, which bounded down mostly to in and around Montreux. For the planning of walks, I downloaded two helpful maps which also include the transportation system possibilities. You will find them at the bottom of this page. Flying commercial airlines these days seems to be a volatile business. You never know who is actually operating, be it due to temporary outsourcing, hiring of personnel and/or entire planes with crews, or other things due to opening up more routes than they actually have the capacity to. This particular flight was at the moment outsourced to a company named Transwede, and they decided that the plane to carry us safely to Zürich airport would be a British Aerospace Avrojet 85, which I must admit looked more like an overgrown bathtub than something actually flightworthy (and judging by a few other comments, I wasn't the only one to think so). The plane trip went well enough anyway, at least southwards. Well on the ground at Zürich airport, and in familiar surroundings, it wasn't much of a hassle picking up the rental car (a BMW 160-or-something) and a quick baguette before leaving. This time, the drive towards Luzern through the winding valley which leads to the autobahn seemed longer than last time..odd how memory plays up sometimes. 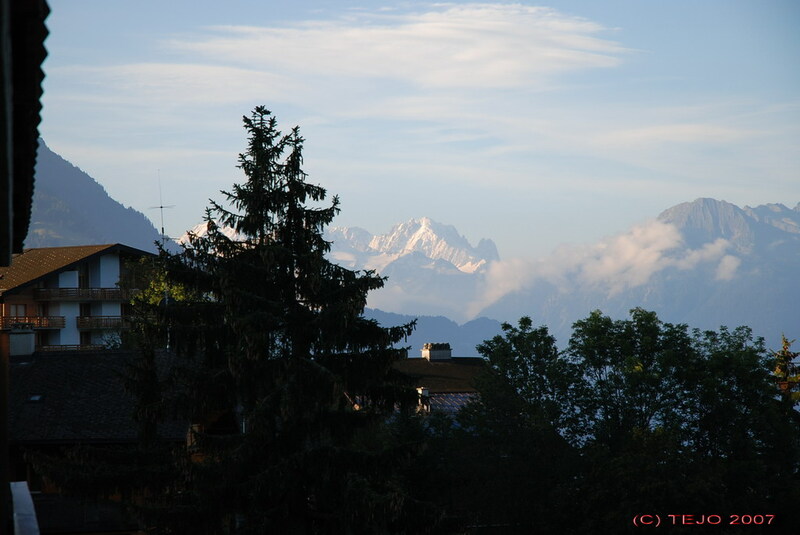 Once in Luzern, it was time to see if Mount Pilatus would be a possible option this year. Well...it was raining and mostly everything was grey, so once again, Mount Pilatus would have to remain unconquered. I wonder indeed. The day is at least as grey as the previous one. No high-mountain trip today, that's for sure! This was a chance for a short drive to park the car in Lauterbrunnen - right at the base of the (probably on a good day only) impressive Staubbachfall, which at the time - in spite of the rain - seemed as if its source was just tap water. From here, a fairly short cogwheel train ride takes you to Wengen - where prices easily double due to its name and fame in the alpine circus - the annual Lauberhorn downhill and combined events take place here around the middle of january. The station itself is situated at 1374 metres, more than 500 metres above the valley station - it is difficult to say which levels the other parts of the tiny village are at, since the terrain is quite rugged. An impressive cable gondola goes seemingly vertically up the hillside to Männlichen, meeting with the one coming from the Grindelwald side. Wengen itself is more or less entirely made out of hotels, restaurants and a few shops, which isn't surprising, as this is normal for mostly any alpine resort village. Parts of the village enjoy a Jungfrau view as well as a Lauterbrunnental view, but comparing it with the one in Grindelwald, it doesn't even come close, especially when considering the rest of the surroundings. Lunch was enjoyed at a small place - goulash soup...mmm :) And the sun decided to be merciful for an hour or so, even! One more thing remained from the list of things to see during poor weather conditions - Gletscherschlucht (yes there really are 3x 'ch' in that word). This was indeed a more impressive experience than I would have imagined it to be. The small river from the lower Grindelwald glacier has, together with the ice, dug out a 100 metre deep, narrow gorge over the millennia. A series of tunnels and walkways have been made to allow the casual visitor to experience the gorge from (literally) inside. The river brings a lot of loose materials and is therefore dark grey in colour. In addition to this, far down below the vertical rock faces, it creates a thunderous roar with echoes in all directions - one might even consider bringing hearing protection along! If visitors feel that walking through the gorge itself is too boring an experience, they have the option of bungee jumping from a platform near its mouth. There is a small hotel situated right at the entrance to the gorge - aptly named Hotel Gletscherschlucht, but I have the feeling this place will feel somewhat dark, cold and unwelcoming in the evening and night, even though the entrance wall is floodlit in the late hours. I tried to capture this wall on a photo from Hotel Glacier's veranda, but without too much success, due to the distance. Situated almost right above the mouth is a small restaurant named Marmorbruch - which isn't much to see at all, and just ended up being a boring walk up and down a winding road. Well..there is less rain, but still grey, and the mountains are more or less gone. So if the mountains hide from Mohammed, Mohammed will leave the mountains. A small trip around the Thunersee worked well, this time without stopping at the St Beatus-Höhlen, since they were covered last time. A stop was made in the village of Oberhofen, mainly due to its neatly situated castle, jutting out into the lake. Even in the grey weather, it made an impressive backdrop and nice motif for a photo. The town of Thun is home to the renowned maker of ski lift systems, Doppelmayr. No stop was made, although it was already nearing lunch time. A stop was tried halfway back towards Interlaken, but the menu seemed to only consist of local food with the danger of getting a lethal overdose of calories. A bit late, lunch was instead enjoyed rought outside the casino in Interlaken - a neat and good lunch combination menu. It is late in the afternoon, but not late enough for dinner...might as well have a walk in the mountains after all, even though the fog is heavy, but at least the rain's mostly stopped! Thus..heading down to the Männlichenbahn station, and asking for a roundtrip ticket with the cogwheel train down from Kleine Scheidegg. The cashier seems a bit doubtful. "It's pretty cloudy up there, yes?" I let him know that I am aware of it but still walking - for the sake of walking in the mountains. "The last train leaves from Kleine Scheidegg at...hmmm" - "18:54" I finish for him. "Yes", he says - and the reward for my extensive knowledge is a double portion of Ricola candy! Or was it a compensation for the poor weather? Surprisingly enough, the temperature at the top of the station was barely lower than it was 1300 metres further below. It is quite a pleasant walk in the thick fog, even though the marvellous view from here is completely obscured by thick fog. It is almost impossible to see all the cows grazing, but they are still very audible with their huge churchbells! Travelling on a cable car in thick fog is a different feeling..there is absolutely nothing out there, and the only sign of nearing the destination is less vegetation and a brighter mass of grey around you. The walk was pleasant for sure..and Kleine Scheidegg was reached an hour before the last train departure. I wonder if the amazing trio of Eiger, Mönch and Jungfrau is still out there somewhere? There's no sign of them at least..just a thick wall of impenetrable, familiar fog..the station area is all but deserted, due to the late hour as well as the weather conditions. A japanese pair walk around, the girl stumbling on high heels - this is not really terrain for gala dinner outfits, and I reflect how sad it must be for these not to experience the awe-inspiring landscape after having travelled halfway around the world. Day 4: Grindelwald, no rain! It's not raining, and the mountains are actually there! Well at least somewhere above the low clouds! It's the last day and if the planned journey to Bachalpsee is going to happen, then it will have to be done today. The Firstbahn valley station lies 5 minutes walk from the village centre, and takes you up into the clouds at 2137 metres in 3 stages - first past Bort (1571 m), then angling a little and climbing steeply towards Schreckfeld (1954 m), where it almost doubles backwards, then climbing the final stage to First. Here among the clouds, or fog, there was absolutely no view whatsoever - even the sheer wall dropping off just behind the restaurant was obscured. The walk to Bachalpsee is a relatively easy one, although it does take some 1 - 1 1/2 hours, as it rises to nearly 2300 metres before dropping down to the lake itself, which is situated at 2265 metres. Some breaks in the clouds allowed for a pic or two to be taken, and also opened up a view of Faulhorn behind the lake, to which the road continues, where a hotel/restaurant is situated at 2681 metres. The return to First was still in fog, and the planned extension to Grosse Scheidegg seemed less attractive, since the clouds were hanging really low over there, so the return trip was instead made to Bort, in which direction the weather was better. True enough, a great view of Schreckhorn (4078 m) and a different view of Eiger (3970 m) from the side - almost as impressive as seeing its north face. The trip from Schreckfeld down to Bort was at times extremely steep, and I regretted not bringing my knee protection for this one - it hurt quite a lot at times, maybe a result of too many steep mountain walks. Somebody must have unconsciously been worshipping the weather gods during the night, as the weather was even better than the previous day. The downside to this was of course that it was time to leave the magnificent mountain scenery of the Berner Oberland region, and head southwestwards. The first stop for the day was the capital of the country, Bern. With only 130.000 inhabitants, it is a surprisingly small capital, especially when considering that the entire country rooms more than 7 million people. The entire historical centre of the town, which is enclosed by a 180-degree bend of the river Aare, is a UNESCO World Heritage site, and is quite large as historical town centres go. The old town clock, reminiscent of the one in Prague, draws quite a few tourists. The cobbled streets are lined with old buildings everywhere, and the wide open space around the main cathedral is a great viewpoint. The parliament building was completely covered in scaffolding and only gave vague hints of its shape. This was a saturday, so there was a big market in town - in places it was difficult to move through the throng of locals (as well as tourists) past all the stalls of cheese, wine, fruit and assorted goods brought in from the countryside. All in all I must admit to being somewhat biased when it comes to historical town centres, and the impression was that this one didn't stand out in particular from all the others. A not too long drive further on, and it was time to enjoy lunch in the very pleasant surroundings of the tiny hillside village of Gruyères, surprisingly enough with free parking. The weather and temperature was wonderful, and the lunch salad was enjoyable. In addition, there seemed to be a gathering of old cars in the town square, which added even further to the feeling of times gone by. It is possible to go for a walk around the entire castle perimeter, and for enthusiasts - there is an H.R. Giger museum (yes, this is his home town) - the name might not sound familiar to many, although many have seen his design works on the mothership and creature in the movie 'Alien'. Otherwise, Gruyères is probably best known for its cheese, Le Gruyère. From the german speaking parts of Switzerland (Berner Oberland) to the french speaking (Gruyères), back to the german speaking parts of Saanen and Gstaad (the latter in which a quick stroll was enjoyed in the fabulous summer/autumn weather), before yet again entering the french speaking part via two mountain passes - the first being Col du Pillon (1546 m), the base for one of several cable cars bringing eager tourists up to the top of the mountain range known as Les Diablerets, which reaches up to a height of 3210 metres, where the 'Glacier 3000' is a ski resort for the eager. The term 'cable car' did not seem correct for this one however, 'cable house' would be more correct, as it loomed above the road on its way up or down - the most surprising part being that the cable system was completely silent. Another break, this time with thé/café/gateau was enjoyed at the local place right on the top of the pass. Another pass was er...passed (Col de la Croix, 1778 m), this one more deserted than the previous one, as it was more or less on a backside-road compared to most of the others so far, yet the destination was easily enough reached - namely the mountain resort village of Villars in the canton of Vaud. After a slight detour, the hotel of choice - Hotel Golf du Villars - was found, and it was already late enough in the evening to seek out a place to dine. Easier said than done, as the village itself seemed to be more or less devoid of life after 18:00. The option was to return to the hotel instead and dine in the restaurant there, although the prices were somewhat steep, but still no worse than what is usual on my home turf - e.g. 38 CHF for a dinner with buffet salad, and fresh meat off the grill. The hotel itself has a marvellous view, if you choose a room on the valley side - seeing 'Aigle by night' is quite neat. When viewing the hillside from one of the courtyards, there is a striking contrast between the old - the castle itself - and the new - the modern super-high-rise motorway which passes above the entire town of Montreux. With that being said, it was time to head the remaining two kilometres into the town centre and find a parking space (slightly easier said than done), then seek out someplace to have lunch. The choice was one of the nearest, a Moroccan named 'Palais Oriental' - the name, placement and facade making you wonder if there is room in the budget for it. The next challenge was to qualify for a seat, as the door/seating guard asked 'avez-vous une réservation?' upon entry. I had to admit that none had been made, but possibly out of kindness of heart, entry was allowed for the not-so-fashionable after a seemingly thorough inspection of available seats. There were indeed quite a few available tables, but as was later observed of what appeared to be a brother-boss-pair, one being the door/seating guard, they did enjoy appearing to be important, including their treatment of the rest of the staff of the place. Nonetheless, a great lunch which consisted of salad and a moroccan style curry chicken & rice dish was enjoyed, and it still didn't manage (quite) to topple the budget. The history of the town of Montreux dates as far back as the days of the Roman empire, but did not attain its present resort status with overpriced hotels until the 19th century. What to do? Stroll along the lakeside walkway together with hundreds of other people, of course! Even with the throng of people, the atmosphere is relaxed, and mostly everybody (apart from a few rollerblades enthusiasts) are just strolling around and enjoying the scenery and the sunshine. It is possible to walk most of the way towards Lausanna, and combine it with the old steamboats which traffic the lake, but a walk of half an hour in either direction will also suffice when there is a lot on the programme. There was an unusual amount of fighter plane traffic around the lake - almost enough to wonder if war was brewing - but it turned out when returning 'home' to Villars that there was an air show in Aigle - no wonder they were so close! One of the more famous sights in the town itself include the statue of Freddie Mercury, who lived partly here. Charlie Chaplin also did, and Deep Purple wrote the song 'Smoke on the Water' after the casino was set on fire in 1971. The casino, along with some of the prime position hotels, are among the more statuesque buildings, this also includes one of the many private schools here - one for hotel management (not surprisingly so) - situated on a high perch above the town, and looking more like Hogwarth's school of Witchcraft. This day was more or less a day of transportation, as the 320 or so km back to Zürich was relatively easily covered, mostly on motorways. There were at least three possible motorway routes, but the one chosen went past the west side of Lac Neuchâtel. There were possible detours with sightseeing, such as Creux-du-Van (which seems to include a 5-hour walk??) and Solothurn centre, but priority was instead given to spending some time both at the airport hotel (Mövenpick) and the rooftop of the airport, which was far less enjoyable this time due to cold and rainy weather. The return trip deserves (or doesn't, but still..) special mention - the overgrown bathtub managed to spend 3 hours fighting against the headwinds, instead of its scheduled 2 hours, and jumped and danced on its way down towards Gardermoen airport. Additionally the seat given by the Swissair check-in counter was the worst possible in the plane - directly below the wing, thus hand luggage had to be placed under the seat in front. I also wonder if it is a Norwegian phenomenon to bring infants along on plane trips, as this seems to happen almost every time. They tend to be a bit young to enjoy plane trips, so why not wait till they are a little older? Addendum - the SAS flight to Zürich is no longer operated by Transwede, but is a regular SAS flight with a 737...maybe more people were slightly dissatisfied with the plane of choice, after all.